The recent purchase of a SISIS Quadraplay and Multitiner drum type tractor mounted aerator has helped Brentwood Rugby Club in Essex achieve their best playing surface for nearly 30 years. 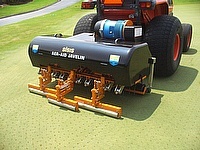 SISIS have chosen IOG SALTEX 2014 to show a new prototype model, designed specifically for synthetic surface maintenance. The company will welcome comments from customers on stand B40 before full production begins later this year. Sisis is pleased to announce the appointment of Stephanie Ambler as export sales administrator. The newly created role also signals the company's rapid growth in the export market. 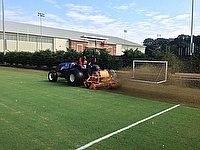 A SISIS Veemo tractor mounted heavy duty de-thatcher and SISIS Multislit tractor mounted deep slitting aerator are helping Clemson University in South Carolina, USA keep on top of its grounds and turf maintenance schedules following head groundsman Ernest Echols' decision to purchase the machines in late 2013. 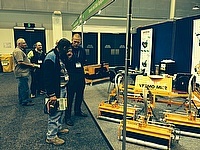 SISIS, together with Dennis mowers have reported a successful show at the recent Australian Turfgrass Conference and Trade Exhibition, held at the Gold Coast Convention and Exhibition Centre, with the SISIS Veemo tractor mounted scarifier the star attraction. 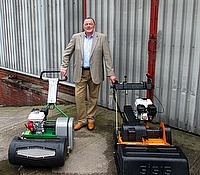 Dennis and SISIS, divisions of the Howardson Group, a leading British manufacturer of innovative world class turf maintenance equipment, have announced the appointment of Ewen Wilson as northern area sales manager, incorporating Scotland, Ireland and Northern England with immediate effect. Dennis and SISIS have concluded their successful 'on the green' education seminars for spring 2014, with a promise of further dates to be added for later in the year. The latest event, which was held at Backworth Miners Welfare Bowls Club in Newcastle upon Tyne and co-hosted with Greenlay Grass Machinery, was attended by nearly 40 greenkeepers as well as local authority personnel all eager to learn more about the maintenance of bowling greens. 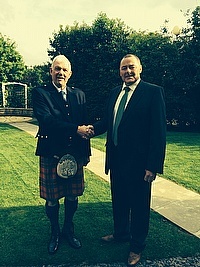 Dennis and SISIS area sales manager Alan Ronaldson has retired after twelve years' service with the company. During this time, Alan was responsible for the development and expansion of dealers for both brands in Scotland, North of England and Ireland. Tottenham Hotspur FC grounds manager Darren Baldwin has chosen a SISIS tractor mounted brush combination of a Zig Zag brush and Flexibcomb which have been fitted to a Twinplay frame for use on both the synthetic and natural surfaces at the club's new training ground in Enfield. 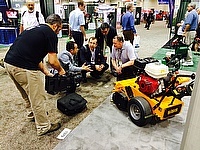 Dennis and SISIS, leading British manufacturers of innovative world class turf maintenance equipment, have reported a very successful Golf Industry Show in Orlando in early February during which they launched two new SISIS products to the US market, generated high quality enquiries and sold several machines from the stand. Dennis and SISIS return to BTME 2014 on stand A5 with a continuation of the successful product launches from IOG SALTEX earlier this year. The joint stand will feature a range of products that have been engineered to provide turf professionals with machines that really perform.